The future is all about visual design. A picture speaks a thousand words. An infographic speaks much more than that. Today, the webpages which are coming in the first top 10 results of the first page, have the average of 1990 words per page. It means users are expecting researched and long articles as more number of words means more meaningful post which leads to insightful and multipurpose content. However, you must know that 9 out of 10 information that is sent to our brain is visual. (Source) Our human mind is aligned to comprehend the visual information better than contextual content. That’s when infographic and Video content can give you the leading edge in grabbing more prospects by leveraging visual marketing. In fact, you will get 12% traffic increase if you use infographics on your website. To get the most out of this mode of communication, you should develop excellent visual infographics for your readers. To do that, you will need skilled graphic designers who can have the ability to cope with deadline-oriented work-life and can deliver breathtaking infographics for the readers. If you don’t wish to invest in hiring dedicated workforce for designing tasks, you can also invest your money in purchasing tools that would give you a ready-made infographics’ templates. If you find that too costly to purchase, you can also try free infographics tools that give instant results and no need for assistance from professional graphic designers. 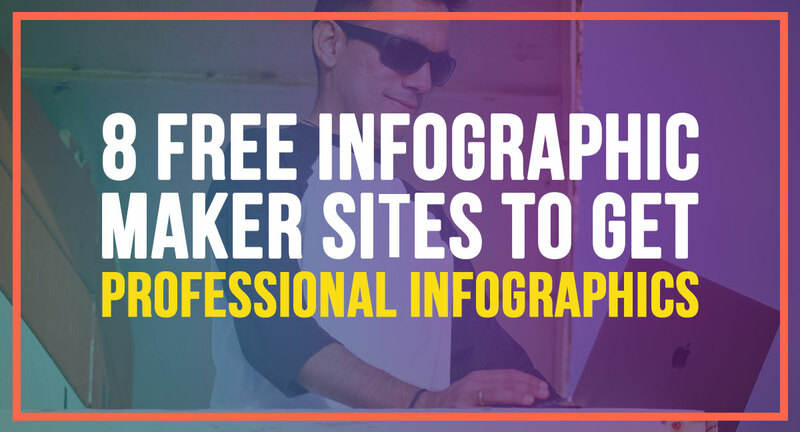 Here is the list of best free infographic maker sites to get professional infographics. Befunky makes easier for non-designers to design an attractive and engaging infographic. The tool is generally used to edit pictures and making collages from your photographs. Such tools allow you to become dependable and create your own designing infographics for your projects. Moreover, the tool does not charge any subscription or comes with a free trial for a few days. Befunky is free to use for anyone. There are free templates which you can use for making your next infographic. By just doing drag-and-drop, you can create instant infographic from this tool. The visuals will allow you to accurately convey complex ideas and data-driven information to your users so that they can understand them instantly. You can also create infographic creatives which can help you cope with your upcoming presentation. This tool will help you elevate your presentation skills to a whole new level. You can convert your boring presentation slides into rich and data-drive infographics that would help you convert maximum prospects from your presentation. You can choose from a series of fonts, shapes and color gradients that will give you vibrant looks to your infographics. As a professor, you can educate boring topics and chapters to your students through an infographic made from this tool. Piktochart is a great tool for data scientists, agencies and professionals who usually have to deal with graphs, charts, and numbers to convince their audiences about their products, researches, and services. Piktochart’s work has been mentioned in the leading website like Forbes, TechCrunch, The Guardian, Moz, Booking.com and Typeform. This intuitive tool has a simple design that provides profound visual storytelling capabilities to its users. You can make infographics that connect with the readers who otherwise would have left your webpage if you have used spreadsheets and charts. The skilled designers of Piktochart have intelligently designed various themes for infographics which cover almost all the genre of users. You need to first pick a design of your choice from 600 templates’ collections of this tool. You don’t have to build your infographic’s flow from scratch. The website already has pre-designed layouts which will give you everything you need for your infographics requirements. You can customize the templates by adding icons, fonts, and attractive color gradients as per your needs. The platform allows you to instantly share your infographics with the world, download the file for printing or share it on social media to convey your message instantly. A designing and communication agency can leverage this tool by collaborating their team members through this tool. Piktochart allows you to invite your team members can collaborate in making designs. Although to access the complete resources of this tool, you might have to sign up for paid version; but this tool has a free version to start designing your presentations and infographics. Vizualize gets your boring resumes and converts them into an interactive infographic. Traditional resumes and the CV formats cannot showcase your expertise. The boring and general document make your resumes redundant and monotonous. Vizualize can showcase your skills to make your profile impactful and buzzworthy. You can sign up in this tool using an email address or through your LinkedIn credentials. Vizualize will read your public profile and access the primary email associated with your LinkedIn account for further use. Once your template is ready, you can edit the layout by adding font, color gradients, icons and make your design compatible with your requirements Vizualize give you an opportunity to showcase your educations, skills and professional accomplishments to get your dream job. Usually, graphic designing tools like Photoshop and Illustrator take hours to complete the design of an infographic but Viseme, which is an online tool, visually transforms your data into comprehensive infographics. For designers and agencies, to invest hours or days behind creating an infographic might not be a good fit. Hence, online tools like Viseme could be of great help for any storyteller to create an impactful and data-rich infographic within minutes and instantly share it with others through the same platform. Used in more than 100 countries, Viseme is trusted by more than 2 million communicators, marketers and advertisers to make excellent infographics for various purposes. Some of the major companies are IBM, NASA, Sony, MetLife, AXA, etc. The tool has a wide range of templates where you no need to start designing your infographic templates from scratch. If you wish to have your own custom-designed template for your infographics, Viseme allows you to do so through its easy user interface. The editing and adding information through Viseme is quick and easy for even beginners to make infographics from this platform. The tool has paid and a free version where the latter allows you to host five projects and use 100 MB of cloud storage so you no longer have to worry about the backup of your creatives. Along with infographics, this tool also lets you design layouts of documents, presentation, website graphics, social media banners and creatives and custom-sized visuals for your business. Venngage is an interactive tool that can provide you an easy user interface to develop infographics. Usually, the infographic is the first choice among spreadsheet and blog because infographics allow marketers to show complex data with ease. The numbers and statistics should be comprehensive enough for the readers so they feel entertained and instantly understands the intent behind sharing those numbers. Infographics can help you achieve these objectives and Venngage allows you to develop excellent infographics for your projects. The platform hosts more than 100 templates for you to choose from. The templates make your workflow easier by giving you a great layout where you just have to adjust numbers and edit your content. If you wish, you can also adjust the color palette to match with your brand and communication. You can create different types of infographics like timeline infographics, process infographics, comparison infographics, and nonprofit infographics, etc. Moreover, you can also create unlimited social media posts, presentation designs if you go for a premium plan. The tool also has a free plan where anyone can use the multipurpose tool to make a stunning visual infographic for their customers through drag-drop features of the editor. Snappa is the first choice graphic designing software for all who don’t know professional graphic designing software like Illustrator, Photoshop, Coreldraw, etc. This cloud-based software allows you to create fantastic creatives for social media, emailers, and flyers for marketing and advertising purposes. As the name goes, you can literally create graphics in a snap and you don’t need any graphic designing and editing skills to start working on Snappa. The user interface of this tool is self-explanatory that you don’t have to take any training to use this tool. Its user-friendly layout does most of the tasks by just drag-and-drop. They take all the technical hustle away from you so that you can create attractive visual for your business. Team collaboration becomes easiest in Snappa because it allows you to invite your team members to share and edit designs, share their designs folders to save on the cloud storage of Snappa. You can retrieve your designs from anywhere and anytime by from a single login from your Snappa account. Snappa has a free and premium account feature. In the free subscription, 1 user can sign up and access more than 50,000 high definition graphics and pictures of Snappa and can download their work on their local system 5 times per month. Although you get a limited number of templates to work you are allowed to make your templates from scratch. Moreover, you also get a chance to have 2 social media accounts. With more than 50,000 designs templates on board, anyone can create stunning visual infographics. Canva is a renowned cloud based free graphic designing tool that can design one of the best and professional creative designs. With the help of Canva, anyone can make attractive and engaging designs for their projects and won’t have to rely on Photoshop for any graphic designing activity. The UI of Canva is too good to be uncomfortable while using it. The intuitive interface can be productively used by just drag-and-drop functionality. You can edit colors and transparency in your every element from a single dashboard. There are various engaging fonts available too for your use which can grab users’ attention and accurately deliver your message. For any designs including infographics, Canva allows its users to apply manual sizing of your creatives in pixels. If you wish to add your own images and icons to give the more customized look to your infographics, Canva allows that too. Although you can import your files but if you can afford a few bucks, Canva also has attractive shapes and images which can elevate the attractiveness of your infographics to a whole new level. These elements usually cost you one-time payment around $1. This amount is usually cheaper than your morning cup of coffee, according to Canva. You can transform the numbers and spreadsheets into interactive and comprehensive charts and tables that provide unparalleled value to your infographics. The video is one of the most engaging forms of content these days. Have you ever thought about making an infographic video instead of creating a long image? Yes, Biteable took the game of Infographics to the next level by allowing its user to make an interactive video. Video has the power to communicate your message effortlessly and effectively. Biteable offers two plans where one is free and the other one is a paid one. In the free version, you cannot download your videos. However, in the free plan, Biteable allows you to share your infographics video on YouTube and from there, you can utilize your video as you like. Biteable has dozens of icons, font styles, templates that can give you amazing infographic videos for different objectives. You can showcase complicated relationships in your infographic video through a smooth transition and decent video quality from from the platform. If you are using either of these online infographic tools, feel free to share your thoughts about them. Also, if you know any other free infographic makers online, also share the name of them in the comments.